In the midst of a L’Oréal PR disaster, Munroe Bergdorf has emerged victorious, having just signed on as the new face of rival brand Illamasqua , to represent the neglected market for women of colour. As the old saying goes: ‘when one door shuts another opens’. Two weeks ago, unless you were living under a rock, the beauty industry was shaken by an unprecedented political controversy. Munroe Bergdorf, L’Oréal’s first appointed trans woman of color, was hired and fired by L’Oréal in the same week after making comments that attacked the institution of white supremacy and structural racism. This was in reference to the Charlottesville Nazi rally where a terror attack killed one person, comments which ironically, subsequently led to her dismissal from the campaign that she was selected to ‘diversify’. However, It was recently announced that rival beauty brand, Illamasqua has signed the trans beauty on to front their own campaign, which has generally been met with support and praise amongst the growing fan base that that Bergdorf is fast accumulating. As Bergdorf and Illamasqua bask in the euphoria of this stellar PR move, let’s take a moment to really analyze L’Oréal’s questionable actions by briefly delving into the history of women of color and makeup brands. From a socio-political context, the issue of women of color being precluded from the beauty industry has been of intense debate for years, as many dark skinned women have stated that they feel neglected by commercial beauty companies. Women of color have been stuck in a cycle of frustration, as the progress on developing makeup for darker skin tones has been somewhat slow. There have been many instances to highlight this. In 2016, Maybelline came under fire in a race row, for selling only six of the 12 dark shades it advertised. Even Hollywood actress Thandie Newton weighed into the debate in 2014, by accusing boots of creating a racial divide through the ‘ghettoisation’ of makeup. She accused the high-street chain of temporarily stocking dark makeup tones, and taking them off shelves earlier than paler makeup shades, making items inaccessible and forcing women of color to shop at specialist stores. On this schismatic topic she stated ‘we’re beginning to think they don’t want us.’ This is a question that many minorities and people of color are posing to themselves. As the latest sales from Rhianna’s near sold-out FENTY makeup line indicate, the market for dark skin tone makeup is an exponentially lucrative arena. The main motivation for developing this makeup line was to create a formula for all skin tones across the color spectrum, because there was a gap in the industry to cater for this marginalized demographic. This is the mark that many makeup brands are and have missed. However, the complexities of this latest controversy go much deeper than just surface skin tone and semantics. It is tied to wider narrative of exclusion. 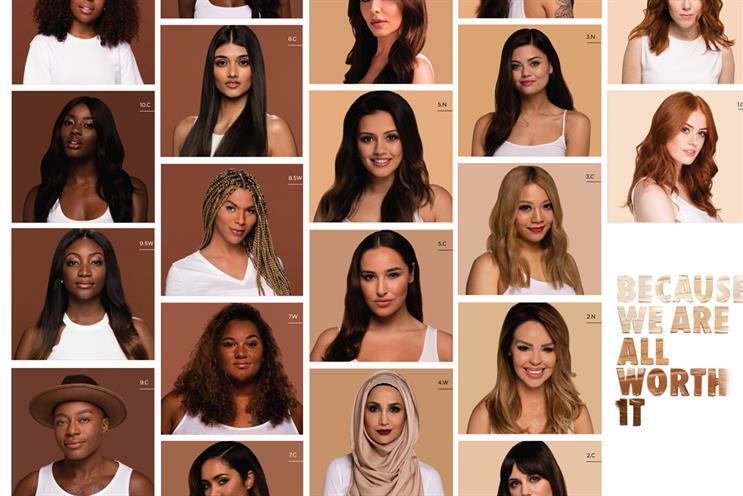 These examples expose the many problematic layers of the politics of the makeup industry to illuminate one key point: that brands want the occasional dark skin tones to promote for profit, but not the concerns, experiences or opinions that come with the package. Attitudes of discrimination are not just rife within the beauty industry. It is a nuance of the inequity faced by people of color in many parts of society in daily reality, as recent statistics indicate. The chilling facts speak for themselves. According to the Independent in 2016, white supremacist and hate groups increased by 600 percent on twitter that is faster than terrorist groups like ISIS, while another poll conducted by the Independent revealed that 9 percent, translating to 22 million, of Americans believe that holding neo-Nazi views was acceptable. There has also been an 18 percent rise in hate crimes across the UK alone this year (Independent, March 2017). What led to L’Oréal dropping Monroe Bergdorf was not because the brand was striving to demonstrate responsibility or political correctness. After all, they hired Cheryl Cole as the main face of their ‘diversity’ campaign, a woman previously charged with punching a black toilet attended in a racially aggravated assault. On the contrary. L’Oréal was in fact propping up the very structure of racism that Bergdorf was outlining. The issue of institutional racism is just a symptom of the wider issue that is a recurring theme in the dark underbelly of a preconceived egalitarian society. Herein lies the truth: A recent Reuters IPSOS poll conducted in the aftermath of Charlottesville rally, revealed that whilst most Americans reject white supremacy, many still hold far right nationalist views. This was the point that Munroe Bergdorf was making, that whilst most western nations deem themselves to be a post-racialist society, white supremacy is a recurring theme that has threatened the free world for decades. It is a violent, nihilistic ideology that was never really defeated, but merely contained, one that does not decline with time, but one that adjusts itself to the preponderating political norms of the time. The FBI and the Department for Homeland Security in early 2017 warned that white supremacy was a growing threat to the US, a threat greater than that of ISIS. That is the concern that Munroe Bergdorf is highlighting. Facts speak for themselves. Bergdorf was a woman selected to front a campaign to sell aesthetics, but instead deviated from the protocols of hierarchical conditioning. Bergdorf demonstrated intellectual critical thinking which eloquently articulates racial discourse, opposing a mainstream plague in our society. This was something that L’Oréal was not prepared to face. L’Oréal could have supported Bergdorf by joining the fight to dismantle structural inequality, but instead chose to obliquely align with the ideology. Or so, it is how many people of color see their actions. Essentially, Bergdorf dared to smash utopian fallacies created by an industry promoting a false narrative. It revealed some uncomfortable truths about race, privilege and history in modern times. This is what led to her dismissal. Where L’Oréal has lost an ample opportunity to connect with groups on the periphery of society, Illamasqua has grabbed this opportunity by the horns by capitalizing on the current political climate. As Munroe Bergdorf doubles down on her political convictions to fly the flag for trans and people of colour everywhere, her fearlessness has earned her a heroic place in history. As her growing influence is yet to be seen over time, this pivotal case has set in motion a new era for the beauty industry and ignited a crucial debate around the salient nature of racism in 2017. This entry was posted in Latest News, Lifestyle and tagged Illamasqua, L'Oreal, Munroe Bergdof. Bookmark the permalink.